In March 2013, Coca-Cola set out to break down barriers and create a simple moment of connection between two nation, India and Pakistan. The Happiness Without Borders initiative, also known as “Small World Machines”, provided a live communications portal between people in India and Pakistan and showed that what unites us is stronger than what sets us apart. 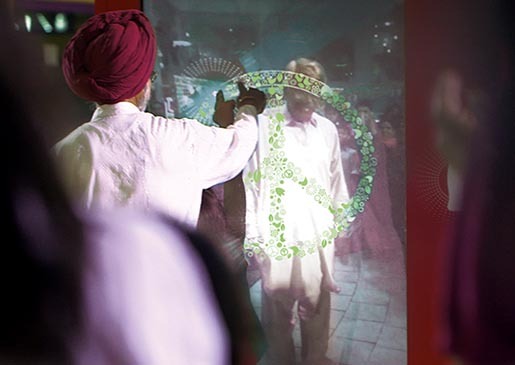 The key to engaging with each other through the machines was simple: people in India and Pakistan could complete a task, like touching hands, drawing peace, love, and happiness symbols, together. In March, the vending machines were placed in two different locations, one in India and another in Pakistan. People were encouraged to put their differences aside and complete a friendly task together – wave, touch hands, draw a peace sign or do a dance – in order to receive a Coke. The actual “Small World Machines” are live portals that take the shape of Coke vending machines. The machines are the first of its kind and have the ability to virtually unite people. 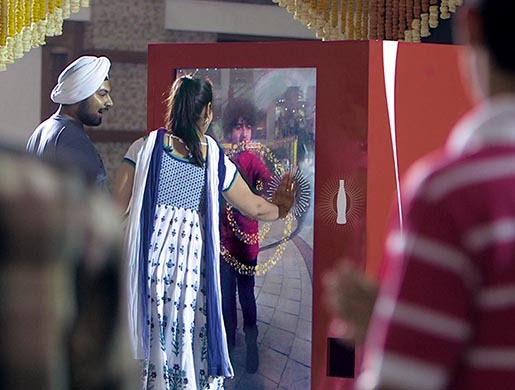 In order to connect people in two different countries and capture such an intimate experience, Coke and Leo Burnett created unique 3D touchscreen technology to project a streaming live video feed onto the vending machine screen while simultaneously filming through the machine to capture a live emotional exchange. This technology resembled the act of looking into a full-length webcam, face-to-face with another person. At the same time, people were encouraged to interact with touchscreen animation including peace signs and smiley faces drawings that could be traced together with hand-to-hand connection. Once the shared tasks were completed, a celebration screen emerged which triggered the vending machine to dispense a free Coke for each person. “Small World Machines” solidifies the notion that what unites humanity is far stronger than what sets us apart. The experience evoked many, heartwarming and emotional reactions. One Pakistani remarked, “It’s great to connect with the average Indian who probably knows nothing about the average Pakistani.” Another Indian said, “It’s something to really bring the countries together,” and “It’s fantastic that you’re allowing people to see the other side as well, to not let it be a mystery anymore.” During the three-day experience, more than 10,000 cans of Coke were given away. The Small World Machines campaign was developed at Leo Burnett Chicago and Leo Burnett Sydney by global chief creative officer Mark Tutssel, chief creative officer/art director Andy DiLallo, executive creative directors Dave Loew and Jon Wyville, creative directors Grant McAloon, Vince Lagana, art director Justin Carew, copywriter Iggy Rodriguez, designers Omari Miller, John-Henry Pajak and David Mugford, director/editor Patrick Fileti, 2nd unit director Angus Forbes, creative technology director Chad Mirshak, creative technologists Brendan Crich, Keong Seet, Scott North, executive director of production Vincent Geraghty, directors of production operations Michael Shanahan, Amir Mireskandari, executive producer Adrian Gunadi, producers Stephen Clark and Michelle Browne, executive strategy director Wells Davis, strategy director Olivier Tse, executive account director Bob Raidt, account supervisor Katie Nikolaus. Leo Burnett partnered with Highlight Films and The Super Group. Set dressing was by Full Circle Corporation Marketing. Music was produced at Song Zu.